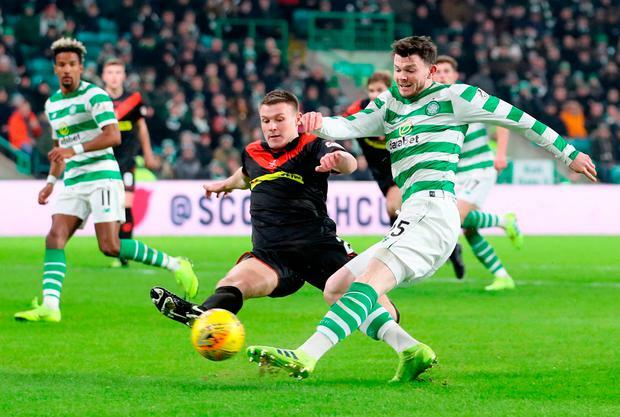 Celtic boss Brendan Rodgers intends to "strip back" Oliver Burke's game as he looks to finally solve the conundrum surrounding the on-loan West Brom player's best position. Burke, 21, has racked up almost £30million in transfer fees already in his career but Rodgers admits the Scotland international is nowhere near the finished article. The Parkhead manager handed Burke his Hoops debut as a lone striker against Airdrie in Saturday's comfortable 3-0 win which sealed the holders' place in the last 16 of the Scottish Cup. But it was a not exactly a show-stopping display from the former Nottingham Forrest and RB Leipzig attacker and Rodgers acknowledged there was work to be done with Burke. "There are a number of positions Oli can play," said Rodgers, who hopes to have frontman Odsonne Edouard back from an abductor injury this week. "He came through the system at Forest as a winger then goes to Leipzig, who don't play with wingers so went through the middle. With Oliver, he's had such a whirlwind few years, with the transfers. But with the talent he has, it's about stripping it all back. "We have to make his role clear. With young players worth a lot of money, sometimes they think they know the game. "But he's still very young at 21. He's nowhere near the finished article but he has so many attributes and strengths. "I love working with that kind of player to see if I can extract that bit more. "We'll give him an environment to learn here. He can be an exceptional player." Celtic had to show patience against Ian Murray's brave League One minnows but took command thanks to Scott Sinclair's double and a debut strike from another new recruit Timothy Weah. Now with home games against strugglers St Mirren and Hamilton plus St Johnstone coming up in January, Rodgers agreed that virtue would be key if they were to keep ahead of Rangers in the title race. "When we look at our next games, teams will defend low against us," he said.